The Great white shark is a mysterious animal and many aspects about them remain unknown. But, with regards to their movement patterns we believe this is largely dictated by prey source and availability. The marine life in False Bay is dictated by the seasons in terms what animals can be found here when. In our spring and summer months warm water currents move into False Bay bringing with it migratory fish and shark species. The South Easter wind that is our prevailing spring and summer wind churns up the ocean which creates an algal bloom. Bait fish such as mullet feed on this plankton and in turn these baitfish provide food for the migratory fish and sharks. The migratory shark species include smooth hound and soup fin sharks. These schooling sharks seem to make up the main part of a great white shark’s summer diet. We believe that these sharks are easier to catch and pose less of a risk to a great white than the cape fur seal. 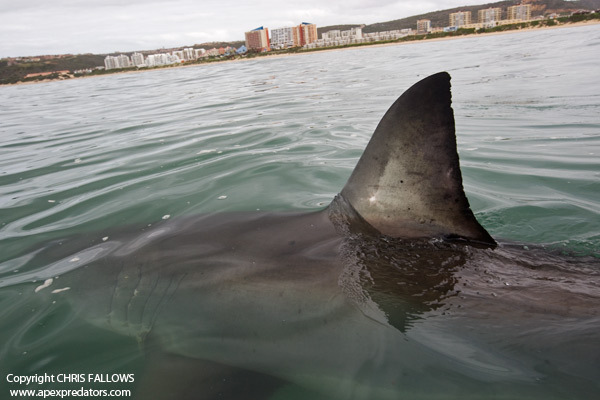 It does mean that over this time period the bulk of the False Bay great white shark population patrols very closer to shore and are often right behind the backline of our beaches. Over this period the chance of interaction between water users and great white sharks is at its highest and alerts are often put out this time of the year. In winter the warm water current leaves False Bay and with this the migratory fish and shark species depart up our east coast. The Great white sharks then turn their feeding attention to the cape fur seals that haul out at Seal Island. Nearly 90% of all predatory events by great whites take place on young of the year seals. At 6 months these seals are weaned off their mothers and must now leave the Island in order to feed themselves and the great whites time their arrival to Seal Island at this exact time. It is on these exit and return paths around Seal Island that the great white has an opportunity to hunt an inexperienced seal and one that is normally on its own, which greatly increases their chances of success. These movements between the inshore environment and seal colonies are observed both in Gansbaai and Mossel Bay. Similar movement patterns in terms of great whites close to shore are also recorded in California and Australia. New information is now showing that great white sharks move between continents. A shark tagged in South Africa travelled to the western side of Australia in 90 days and returned back to South Africa in the same year. Likewise sharks that have been tagged off California have travelled to Hawaii and back. This type of movement makes it even more important that Great white sharks need to be protected worldwide so that they are not harmed when travelling these long distances. Visit the Apex Shark Expeditions website to view the original article. This entry was posted in Shark Information and tagged Apex Shark Expeditions, False Bay, Great White Sharks, Shark Movement by synergize. Bookmark the permalink.